WILMINGTON, NC, August 04, 2018 — Social change never comes easily. It is, in the end, a game of numbers. When a sufficient number of people mobilize around a common goal, changes happen. Many of us remember the pictures and films from the protests in the 50's and 60's. The gathering together – of tens of thousands of individuals – impelled those changes. Today, it is no longer necessary to plan marches or come together physically. Today's young people can join together to enact change through social media. “In an article about the movie 'Eighth Grade,' called 'A Girl's Life in a Funny, Scary World' by the New York Times, Kayla, played by Elsie Fisher, spends a lot of time tethered to a cellphone that serves as her touchingly imperfect portal to the world,” Holstein stated. “In the film she often puts up on selfies videos of herself on her online channel. “The truth is, many of us of all ages are 'doing it'. That is, taking selfie photos and videos and placing them all over. We share, we embarrass, we learn info, we follow characters and strange unreliable news, be it new aliens from outer space or hidden treasure. “For several years I have been makings Selfie short films. My most recent, 'Conflict', focuses on drugs, alcohol and bullying as they affect the life and thoughts of a young teen. 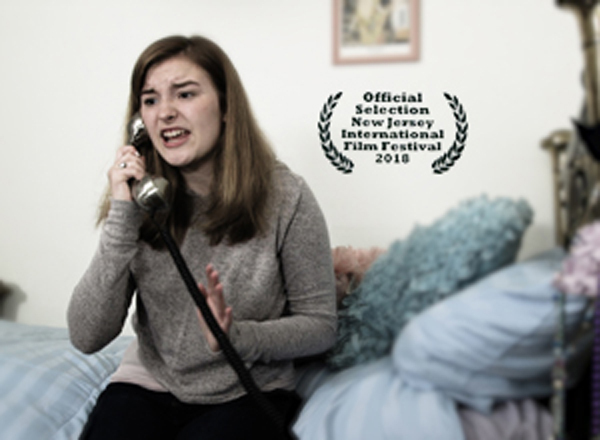 The 'girl' played by Megan Brown uses her smart phone, as does Kayla, in 'Eighth Grade' to share her pain, confusion and reactions to these problems. A powerful film, augmented in its effectiveness by the fact that the actress filmed scenes herself, unwatched by a crew and able to let loose just as kids do in real life in their bedrooms making a selfie video. “Kids, tweens and teens needed a new voice. A voice that corresponds to today's culture. A voice beyond the hidden recesses of a diary or tears in a pillow. And that voice is here today for almost all kids. It is the selfie video.